White House Caves as the 35 day shutdown ended. President Donald Trump delivered remarks at The White House saying he has reached a deal with democrats to re-open the government for three weeks. 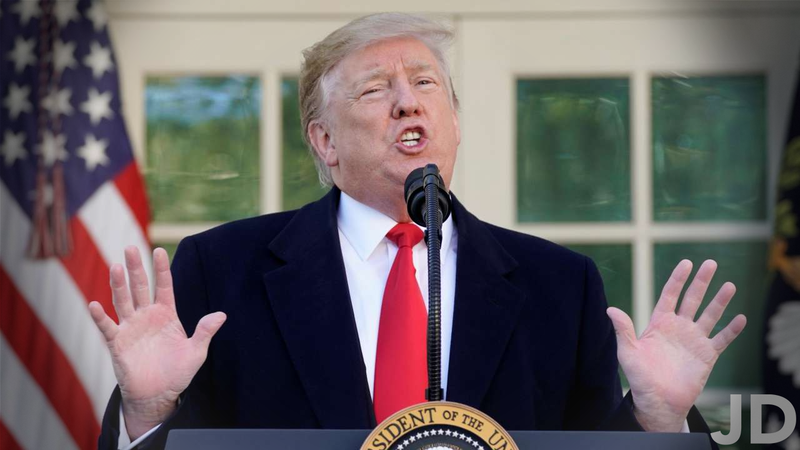 He also said, if negotiations do not go well with the democrats, he is prepared to shut down the government once again on February 15, and potentially declare a national emergency. Roger Stone was arrested Friday morning when he woke up to The Federal Bureau of Investigation raiding his Fort Lauderdale Home. 29 Federal agents swarmed Mr. Stone’s home, took him into custody, and transported him from his home to a federal courthouse, where he later delivered remarks about his arrest. In the podcast, I mentioned a spectacular interview Roger Stone did with CNN’s Chris Cuomo. Below is part of an article I wrote about Mr. Stone and his arrest. Take a look at the full article on The Doherty Files. As I’ve covered in the podcast and other forms of my content, it is now becoming more evident that Jerome Corsi has become one of the many prominent political figures in Robert Mueller’s Political Investigation. This morning, Roger Stone woke up to The Federal Bureau of Investigation raiding his home. Stone, an associate of Donald Trump, and famously a guest/co-host on Alex Jone’s InfoWars was indicted on 7 counts. According to the Federal Report, Roger Stone was charged with 1 count of “Obstruction of Justice”, 5 counts of “lying” to investigation teams about the Russia-based Trump Campaign Attack, and one other count of witness tampering. Stone has infamously denied all of these accusations even before they were made federally official, and said he is completely innocent, and has done nothing wrong. How does The White House respond to this? As you may be able to imagine, The White House jumped on this story pretty quickly denying any involvement with Roger Stone, and the charges that have been placed on him. This Friday morning, Sarah Sanders stood proudly in front of The White House and denied any interaction with Roger Stone and The White House saying exactly Roger Stone and the charges made “has nothing to do with the President”. How does Roger Stone respond to this? In a press conference held outside of a courthouse where he was in Florida, he continuously said he was innocent, and stated the arrest and tactical measures used against Stone were sad. Mr. Stone also said that all of these charges are politically motivated, and he, himself is convinced he is not guilty. In addition to these statements, Stone said he will definitely not testify against President Trump. He proclaimed all of this as a crowd gathered behind the news media chanting “Lock him up!”. WikiLeaks. Organization 1 is WikiLeaks. For those who don’t know, WikiLeaks is the privately run agency that is responsible for researching leaks, publishing leaks, and is technically a politically skewed data management company that offers its assets publicly for free. To a more famous and relevant point, WikiLeaks led the publishing effort for the 33,000 emails Hillary Clinton deleted. This move, led by Julian Assange, the founder and president of WikiLeaks is also heavily in Mueller’s investigation. There are so many things we still do not know. More prominently, though, were the extent of all the communications made by the parties involved. We learn as much as we know in this paragraph of the memo. “During the summer of 2016, Stone spoke to senior Trump Campaign officials about Organization 1 and information it might have had that would be damaging to the Clinton Campaign. Stone was contacted by senior Trump Campaign officials to inquire about future releases by Organization 1.” Remember, Organization 1 is WikiLeaks. More updates to come on this story. Sign up for email notifications to learn more.